Scott Weiland was found dead on his tour bus in Minnesota Thursday evening at the age of 48. A statement issued via the singer’s social media sites reads: “Scott Weiland, best known as the lead singer for Stone Temple Pilots and Velvet Revolver, passed away in his sleep while on a tour stop in Bloomington, Minnesota, with his band The Wildabouts. Weiland and his band were scheduled to perform at the Medina Entertainment Center in Medina, Minnesota Thursday evening. No specific details regarding cause of death have been made public at press time. Rolling Stone reports Jane's Addiction guitarist Dave Navarro announced the news of the singer’s passing in a since-deleted tweet shortly after midnight EST. 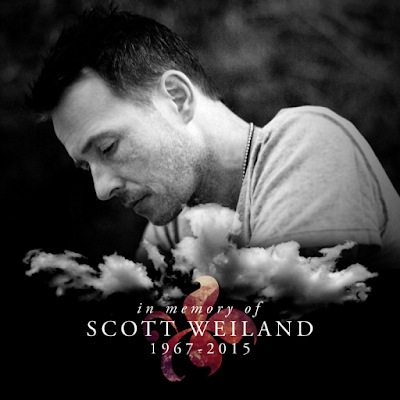 "Just learned our friend Scott Weiland has died," he wrote. "So gutted, I am thinking of his family tonight." Weiland teamed up with bassist Robert DeLeo, guitarist Dean DeLeo and drummer Eric Kretz in San Diego, California in the late 1980s and performed as Mighty Joe Young before the group changed its name to Stone Temple Pilots. The band’s 1992 debut, “Core”, peaked at No. 3 on the US Billboard 200 on its way to selling more than 8 million copies in the States alone. Their 1994 follow-up, “Purple”, debuted at No. 1 on the Billboard 200 and went on to sell 6 million in the US. STP rode a string of hits and declining album sales before disbanding in 2002 after Weiland reportedly wore out his welcome with the DeLeo brothers. The singer joined supergroup Velvet Revolver in 2003. Featuring former Guns N’ Roses members Slash, Duff McKagan and Matt Sorum, the band was rounded out by former Wasted Youth guitarist Dave Kushner. Touring and a second album, 2007’s “Libertad”, followed before Weiland returned to STP in 2008. The reunion resulted in tours and 2010’s self-titled release before Weiland was fired from the group in 2013 and replaced by Linkin Park vocalist Chester Bennington, who remained in the lineup until exiting last month.